I had the privilege to host a screening of this film with guest speaker Professor Miri Kubovy as part of Temple Israel of the City of New York’s Reel Judaism summer film series. 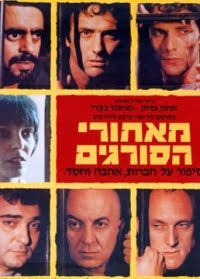 This 1984 nominee for Best Foreign Film from Israel is a profoundly engaging, extensively disturbing depiction of life within an Israeli prison. Its depiction of the Israeli criminals and Palestinian terrorists doesn’t favor either group, but definitely does dig deep into the complex relationships the two parties have as they find themselves united in hatred against the guards. What’s most intriguing about this film is that, though it feels dated in many respects, these characters and these sentiments could well exist today. Like a number of films coming out of Israel today, it’s not easy to digest, nor does it portray Israel or Israelis in the most positive light, and it’s that very complexity that makes it most compelling as a portrait of one segment of Israeli society. This film is not easy to find in the United States, but if it sounds worthwhile, try an Israeli version with English subtitles.